"From Boots to Black Tie"
It is the customer’s responsibility to advise Out Back Catering of any difficulty in location delivery, for example, narrow gateways or doorways, steps, long distances, etc. Prices quoted are cash or check. Balance due 7 days prior to day of event. Payments overdue are charged a 20% late charge and 2% interest per month. Out Back Catering must receive the item count one week before the event. The Per Item Total is based on item count plus any additional items served. An additional delivery charge may be made if delivery and pick up of the above equipment cannot be made at the discretion of Out Back Catering. Staffing charge will include delivery, set-up, serving and pick-up time. Cancellations of this contract must be made 60 days prior to the event. This contract is offered subject to scheduling, and is not confirmed until deposit is accepted. Please review, sign and return with your deposit. Carrot, Celery, Jicama, Broccoli, Cauliflower, Cucumber, Red Radish, Cherry Tomatoes and a Ranch Dip displayed in a wicker basket. Sliced by the Chef and served with BBQ and Horseradish Sauce. Plump and juicy, Seasoned and Grilled served with our own sauce. Romaine Lettuce and our homemade Croutons gently tossed with our secret Caesar Dressing. Menu prices are based on a minimum of 50 guests. Include disposable plates, cups, napkins and tableware as necessary for the food we provide. Prices do not include applicable delivery, staff charges, gratuity or sales tax. Staffing charge is at the rate of $20.00 per hour, minimum 5 hours. Chicken marinated and cooked with our barbecue sauce. Cooked over an open fire then sliced and served with fresh salsa. Tender and moist beef ribs, marinated and cooked with our barbecue sauce. Chicken in a spicy marinade with lemon juice and olive oil. Served with salsa. Julienne cuts of chicken served sizzling hot with an authentic Mexican flavor served with flour tortillas, lettuce, taco sauce, Jalapeno peppers, shredded cheese, guacamole, salsa, and sour cream. Served in a sombrero with salsa. Fried Dough Sticks with cinnamon and powdered sugar. A chicken breast marinated in lemon juice, rosemary and garlic – then grilled to perfection. Slices of Eggplant, Zucchini, Banana Squash and Green Peppers Grilled over an open fire. Topped with fresh roma tomatoes sautéed in olive oil with basil and Garlic. Chicken marinated in teriyaki and grilled to perfection. Beef, marinated then skewered with peppers and onions. Marinated in Kalua sauce and served with a Hawaiian Teriyaki sauce and glazed pineapple rings. Salmon marinated in fresh lime juice, garlic, dijon mustard, finely chopped scallions and lightly grilled. Made with Iceberg and red leaf lettuce, red cabbage, mandarin oranges, and rice noodles topped with an oriental dressing. Shredded cabbage, carrots and purple cabbage dressed with our oriental dressing and garnished with Mandarin Oranges and Peanuts. Chopped lettuce, mozzarella cheese, garbonza beans, black olives, and chopped zucchini. Flour tortillas with cheese, grilled until crisp cut into triangles and topped with sour cream, salsa, guacamole. Shredded lettuce, Chopped tomato, diced onion and Cilantro, shredded cheddar cheese and fresh salsa. Romaine lettuce, diced tomatoes and Cilantro-Ranch Dressing topped with Tortilla Strips. Menu prices are based on a minimum of 50 guests. Include disposable plates, cups, napkins and tableware as necessary for the food we provide. Prices do not include applicable delivery, staff charges, gratuity or sales tax. Menu prices are based on a minimum of 50 guests. Include disposable plates, cups, napkins and tableware as necessary for the food we provide. Prices do not include applicable delivery, staff charges, gratuity or sales tax. Staffing charge is at the rate of $20.00 per hour , minimum 5 hours. An artistic display of fresh fruit in season. Fresh “WESTERN BAGELS” with Whipped Cream Cheese. 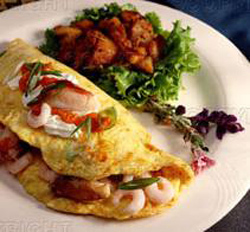 Omelettes prepared to Order with fillings of Chicken, Ham, Cheddar Cheese, Mozzarella Cheese, Green Onion, Mushrooms, Green Peppers. Olives, Chopped Tomatoes, Spinach, and then topped with Sour Cream. sales tax. Staffing charge is at the rate of $24.00 per hour , minimum 5 hours. Potato with Goat Cheese or Thai Chicken Sate with Peanut Sauce. Squares of our Homemade Quiche garnished with Sour Cream. Crostini with Sun Dried Tomato Concasse and Feta. Stir Fried Vegetables wrapped in a Wonton and deep fried. stuffed in a Mushroom Cap. A blend of Sausage, Mushrooms and Spices in a Mushroom Cap. A blend of Meat and Spices in a Puff Pastry Pocket. Mini Hot Dogs wrapped in a Biscuit and served with a Mustard Dip. Sour Cream, Salsa and Guacamole. Tasty Beef Meatballs in a Creamy Sauce with Nutmeg and Mushrooms. Bite-sized traditional. Cabbage stuffed with Beef in a Tomato Sauce. Hot & Spicy Chicken Wings with our Bleu Cheese Dressing. Pieces and Fresh-Cut Apple Wedges for dipping. Crusty Sourdough Bread with pieces of the bread for dipping. Crispy fried Mini Chicken Drummettes. Skewered Shrimp basted in Garlic and Lemon Butter and grilled. Tomatoes stuffed with Spinach Pesto. A flowing display of fresh fruit of the season. Brie encrusted in a Puff Pastry. Warm, creamy Cheese Sauce with an Assortment of Vegetables and Breads for dipping. 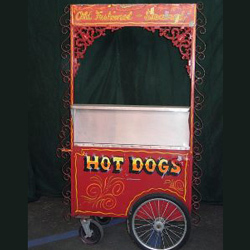 Our fun and festive food Carts work well to create a Carnival Atmosphere at your event. They are decoratively painted, and perform as display, cooking, and serving stations. Many carts may be used to serve more than one item. Most carts are available for $95 per day, with an additional charge for the serving staff and the food items supplied for your party. We have a professional, courteous and experienced serving staff who will set-up and serve you and your guests. They are also available to assist with other needs, such as cutting and serving cake, setting up your beverages, and cleaning up. The hourly charge is $24 per staff member, with a 5 hour minimum; this includes delivery, set-up, serving and clean-up time. An additional delivery charge may be applicable – please call for a quote. As a full service catering company we can offer many other items without the use (and expense) of carts, and will be happy to share our ideas with you. Let us help your ideas to flourish! With your choice of Chili, Sauerkraut, Mustard, Relish, Catsup and Onions. Beef or Turkey. Grilled to perfection with Cheese, Lettuce, Tomato, Pickle Chips, Onions, Grilled Onions, and Mayonnaise. on a bun and dressed as you like with Mayonnaise, Lettuce, and Tomato. Served with Fresh Grilled Onions and Sauce on a fresh REAL Italian roll. triangles, and served with Salsa and Sour Cream. Specially Seasoned Chicken served in a Corn Tortilla, Cheddar Cheese, Jalapeno Peppers and Salsa. Cooked while you watch over an open fire. Omelettes prepared to Order with fillings of Chicken, Ham, Cheddar Cheese, Mozzerella Cheese, Green Onion, Mushrooms, Green Peppers. Olives, Chopped Tomatoes, Spinach, and then topped with Sour Cream. Iceberg and red leaf lettuce with red cabbage, tomatoes and cucumbers served with Ranch Dressing. Potato Pancakes made while you watch and served with Apple Sauce and Sour Cream. Hand Scooped Vanilla Ice Cream. Toppings include: Hot Fudge, Whipped Cream, Cherries, Nuts, Strawberry Sauce, Butter Scotch, Crushed Cookies, M & M’s, Granola, Rainbow Jimmies, Raisins, Sprinkles, and Chocolate Chips. BELGIAN WAFFLES – Great with ice cream! Freshly Brewed Regular and Decaffeinated Espresso and Cappuccino, topped with Shaved Chocolate, Cinnamon or Nutmeg. Yield is approximately 80 servings. Cups and Straws included, you must provide the alcohol. The wedding was GREAT! But, with so many friends and family here from out of town, a “not too early” brunch is a nice way to say thanks and goodbye. Your “Big Day” is almost here. Your done the last walk through. It’s time to relax with famialy, friends and some good casual food before you in the spotlight. such as tomatoes, lettuce, pickles, cheese and onions. Plump and juicy, marinated and served with our special barbecue sauce. So, the party is winding down. You’ve married, had the appetizers, the toast, the 1st dance, dinner, and done the cake cutting. Your guests have danced (and drank) the night away. Now it’s the wee hours of the morning and hunger has returned. Might we suggest…..
Quarter-pound hamburgers served on a bun with all your favorite trimmings such as tomatoes, lettuce, pickles, cheese and onions. Have your wedding in the warmth of your home or at the beach or at your “special place”, and let OUT BACK CATERING meet all your needs. We will make the setting perfect. When when your “special day” is over, our staff will do the clean up. We can make the Non-Traditional wedding a party your guests will remember with food, service and decor of your special theme. We’ve done many Country-Western weddings, along with Luau-Beach parties, Mexican Fiestas and Hors d’oeuvres under the stars. Below you’ll find a sample of our menus, but we have many more great ideas. Please call if you have any questions. Doug Noland, President, OUT BACK CATERING. P.S., Don’t forget the shower, bachelor(ett) party, rehearsal dinner or the after wedding Sunday brunch. The following menus are suggestions of types of foods and presentations that we can further develop for you. Each of these can be presented formally or informally. These prices are based on a minimum of 50 guests, with the addition of the charge for our staff at $20.00 per staff per hour. See below for an explanation of different staffing levels. 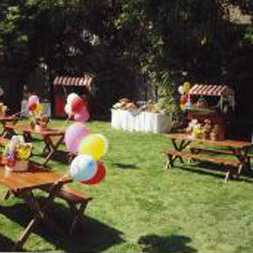 We can also provide a bartender, flowers, rentals and entertainment. NOTE: The menu items above are presented as a flowing cascading display. The menu items below are tray passed by our staff. Western presentation may include, our chuckwagon, whiskey barrels, spittoons, steer horns, old fashioned water pump, hay fork, hang man’s noose, cross cut saw, sickle, kerosene lanterns, horse blankets, cast iron bean pots, dinner bell, blue enamel corn pots, house shoes, western saddle, old fashioned ice cream maker, wooden fence, hay fork, “Buck and Betty Cowboychecks” bales of straw and staff in western dress. Mexican presentation may include colorful Mexican blankets, sombreros , Clay Pottery and Pinatas. Hawaiian presentation may include palm trees, carved wooden masks, leis, sea shells both large and small, fishing nets and tiki torches. The more things you ask our staff do for your guests, the greater the number of staff that will be required. For example, the following needs impact the number of staff required: tray passed appetizers, dinner and dessert, wine, water, champagne and coffee served to your guest at their seats, service on china vs. disposables. All of these choices require more staff to implement and especially add more time to pre-set tables and when finished, to rinse and repack the rentals. Typically, for a formal party of 100 guests, 8 staff including a bartender for 7-9 hours, will run approximately $1100-1500.00. Food that is served buffet style on disposable plates where guests help themselves to drinks requires less staff. Typically, for a casual party, 3 staff for 5-6 hours for 100 guests would be sufficient, and would run approximately $360-$480.00. All staff recommendations are done with your needs in mind. Please call to discuss. In support of our community, OutBack Catering has worked in conjunction with schools, temples, churches and other not for profit groups. We have provided our services at events such as Walks, Runs, Casino Nights, Poker Nights, Silent Auctions, Carnivals, Fairs, Street Festivals, Etc. Depending on the nature of the group and the level of involvement of staff and volunteers, we have, on occasion, donate the use of our equipment, food and services. Although we are a full service catering company providing food, staff and equipment as per our contracts, we have also operated as a Concessionaire. As a Concessionaire, we will sell food and return a commission to the group as per our agreement. Below is a partial list of some more popular foods for concession vending. We will be happy to discuss any ideas you may have. Please call. For a first dance that your guest’s will remember! 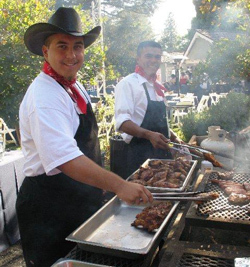 Let OUT BACK CATERING bring our many years of experience to your next barbecue. Savor the aroma as our skilled staff grills right in front of your eyes – it’s sure to make your mouth water. 8 ounces Grilled to perfection, served with a Steak Sauce, BBQ Sauce, Dijon Mustard and Horseradish Sauce. Made Fresh at our Latka Bar, served with Sour Cream and Apple Sauce. Potato, Beef, Liver, or Kasha. Cabbage stuffed with Beef and Rice, and baked in a Tomato Sauce. Served in a Decorative Mold or on Cocktail Rye. A Fried Dumpling Filled with Chicken, Liver, Beef, Kasha, or Potato and Cheese. Potato with Goat Cheese, Kasha with Sun-Dried Tomato or Chicken Satay with Peanut Sauce. For Bagels, Bagel Chips and Crackers. Served with real turkey or beef gravy and butter. Small sausage larva in a biscuit cocoon filled with a tasty insect goo. Traditional deviled eggs with whiskers and tails. Big bird got out of hand! Wormy hamburgers served on a bun with all your favorite trimmings such as tomatoes, lettuce, pickles, cheese and onions. Burritos served with an interesting twist, filled with beef-bean nose blow, rancid mucus guacamole, sour cream-fresh mucus and bloody nose chunks of tomato. Romaine Lettuce and our homemade Croutons gently tossed with our secret Caesar Dressing, Amniotic Fluid and Placenta Bits. Vanilla milk shake with a blue hue. Artistically displayed in baskets, accented with Coconuts, Pineapples and Bananas. Skewers of Beef, Hot Sausage and Peppers with a red pepper glaze sauce. A very traditional Caribbean dish. Marinated in a tangy Lime sauce, grilled to perfection. Served with Dominican Dressing of Chopped green olives & capers in vinegar and oil. Potato Fritters with Jalapeno Peppers, Jack Cheese and Shrimp served with Sour Cream, grilled while your guests watch. A great way to end a great meal. Chicken or beef with tomatoes, onions and peppers. Prepared as your guests watch and served with pita bread, shredded lettuce, thin sliced red onion, chopped tomatoes, hot sauce and hummus bi tahini. A salad of romaine lettuce with olives, and feta cheese dressed with olive oil and vinegar, fresh herbs and spices. Buffet tables as well as guest tables may be decorated with 45 Records, Jacks, Marbles, Hoola Hoops, Candy reminiscent of the 50’s, confetti, mini Juke Box, Balloons, Paddle Balls and more. Large foam cut-outs depicting 50’s nostalgia are also available. Plump all beef hot dogs complimented by your choice of toppings; chili, sauerkraut, mustard, catsup, relish and onion. Served on grilled Rye Bread with cheese and grilled onions. Plump and juicy chicken, served with mashed potatoes and gravy. Just like Mom used to make! Served with mashed potatoes and gravy. Marinated steak, sauteed w/ peppers, onions, mushrooms & cheese, served on a French roll. Deep fried strips of boneless chicken served with honey mustard sauce. Western presentation may include a chuckwagon, spittoons, whisky barrels, steer horns, old fashioned water pump, hay fork, hang man’s noose, cross cut saw, sickle, horse blankets, cast iron bean pots, dinner bell, horseshoes, blue enamel corn pots, Western saddles, wooden fence, old fashioned ice cream maker and our staff dressed in Western attire. Menu prices are based on a minimum of 50 guests. Include disposable plates, napkins and tableware as necessary for the food we provide. Prices do not include applicable delivery, staff charges, gratuity or sales tax. Staffing charge is at the rate of $20.00 per hour , minimum 5 hours. A Flowing Fountain, Wicker-Wrapped Bottles of Chianti, an assorted array of Dried Pasta and Garlic. Black Olives, Cherry Peppers, Pepperoncini, Marinated Mushrooms, Marinated Artichokes, Sliced Italian Salami,Sliced Pepperoni, Provolone, Mozzarella, Carrot Sticks and Celery Sticks. Pureed artichokes, garlic and parmesan cheese served hot in crusty round bread with pieces of sour dough bread for dipping. A blend of sausage, mushrooms and spices stuffed into a mushroom cap. Cheese tortellini marinated in Italian dressing. Tomatoes stuffed with spinach pesto and baked. Grape leaves stuffed with a blend of rice and herbs. Chicken pieces simmer in a tomato sauce with mushrooms. Best with pasta. Topped with Mozzarella-Adagio Cheese blend, fresh Tomatoes, fresh Basil and Garlic. Topped with Mozzarella Cheese blend, fresh Tomatoes and Sauteed Mushrooms. Topped with Tomato Sauce, Roasted Eggplant, Mozzarella Cheese blend, Zucchini, Peppers and Onions. TOPPED with fresh Roma Tomatoes saut‚ed in Olive Oil with Basil and Garlic. Fettucini noodles gently tossed with our homemade Alfredo Sauce. Fettucini noodles gently tossed with our homemade Alfredo Sauce and Juliennes of Chicken. Rotelli pasta with Chicken, 3 color Peppers, Red Onion, and fresh Cilantro in a Tequila Lime and Jalapeno Cream Sauce. White Wine, Clams, Mushrooms and Leeks with Lots of Garlic. Tomato Sauce with Basil and Garlic, served over spaghetti. Pastas can be served individually or in any combination. This can make a Great Station at your event, with a number of choices being prepared while you watch. Please choose from Sauces described above. Pasta Choices Include: Angel Hair, Fettucini, Fusilli, Linguine, Spaghetti, and Spinach Cheese or Chicken Tortellini. Add any or all of the following extras: Toasted Pine Nuts, Sauteed Onions, Saut‚ed Peppers, Sauteed Mushrooms, Parmesan Cheese, Black Olives, Italian Sausage, Meatballs, and Crushed Hot Red Peppers. Colorful Mexican Blankets accent our buffets with colorful Sombreros amidst Clay Pottery. Mini-Tacos served with the following condiments: lettuce, chopped tomatoes shredded cheese, guacamole, salsa, and sour cream. Flour tortillas filled with beans and cheese. Flour tortillas with cheese, grilled until crisp cut into triangles and topped with sour cream, salsa and guacamole. Pastry-puff filled with Mexican spiced meat. Jalapenos Peppers filled with ricotta cheese, batter dipped and deep fried. Grilled Beef Steak Marinated with Lemon and Spices. Chicken in a Spicy Marinade with Lemon Juice and Olive Oil. Julienne cuts of chicken or beef served sizzling hot with an authentic Mexican flavor served with flour tortillas, lettuce, taco sauce, jalapeno peppers, shredded cheese, guacamole, salsa, and sour cream. Shredded cheddar cheese wrapped with a corn tortilla and topped with a tangy sauce. A traditional stew of chicken and pork with hominy, seasoned with garlic and chilies. Shredded Beef with an authentic Mexican flavor served with flour tortillas, lettuce, taco sauce, shredded cheese, guacamole, jalapeno peppers, salsa, and sour cream. Romaine lettuce, diced tomatoes and Salsa-Ranch Dressing topped with Tortilla Strips. Made Fresh, Fried Dough Sticks with cinnamon and powdered sugar. Hawaiian Presentation may include Palm Trees, Carved Wooden Masks, Leis, Sea Shells both large and small, Fishing Nets, and Tiki Torches. Displayed and Carved on our “Pig Board”, decorated with Fresh Greens and Whole Fresh Fruits. Pork seasoned and wrapped and slowly roasted until tender. A Grilled Boneless Chicken Breast marinated and seasoned with Ginger. Tropical Fruits picked at the peak of ripeness in an attractive display. A variety of fresh vegetables batter dipped and deep fried while your guests watch and served with sweet and sour sauce and hoisin sauce. Quiche Lorraine, Florentine, Shrimp, or Mushroom & Broccoli. Made fresh topped with Syrups and Fruit. Your and your guests create your own Ice Cream Sundaes! Toppings include: Hot Fudge, Whipped Cream, Cherries, Nuts, Strawberry Sauce, Butterscotch, Crushed Cookies, M & M’s, Granola, Rainbow Jimmies, Raisins, Sprinkles, and Chocolate Chips. We have the cake for your occasion, whether it be a Birthday, Wedding, or Bar Mitzvah. Call for more information. A delicious cake made with real carrots and a creamy butter frosting. Traditional cheesecake, with or without fruit toppings. Rich Chocolate Brownies served with vanilla Ice Cream and Hot Fudge. Smooth creamy flan with a rich caramel sauce. Chocolate Chip cookies baked with a taste of home. Served with vanilla Ice Cream. Served hot all alone or ala mode. Crisp sweet apples wedges covered caramel or hot fudge. Plump, juicy strawberries dipped in chocolate. Chocolate covered bananas dipped in nuts or plain. A decadent sweet Italian treat. Warm chocolate with an assortment of fresh fruit in season and pound cake for your dipping pleasure. Warm, crisp Belgian Waffles topped with a mixture of apples, bananas and brown sugar. Pastas can be served individually or in any combination. This can make a Great Station at your event, with a number of choices being prepared while you watch. Angel Hair, Fettucini, Fusilli, Linguine, Spaghetti, and Spinach Cheese or Chicken Tortellini. Toasted Pine Nuts, Saut‚ed Onions, Sauteed Peppers, Sauteed Mushrooms, Parmesan Cheese, Black Olives, Italian Sausage, Meatballs, and Crushed Hot Red Peppers. Cooked over an Open Fire while you watch! Topped with Mozzarella-Asiago Cheese blend, fresh Tomatoes, fresh Basil and Garlic. Vegetables. Served over Steamed Rice. A flavorful Chili of Pinto Beans and Vegetables, with Shredded Cheese, Sour Cream, Chopped Onions and Jalapeno Peppers. Can be served in individual Sour Dough Rounds. Eggplant topped with Cheese and baked with marinara sauce. Cheddar Classic, Crunchy Nacho and Avocado-Tuna, made while you watch! 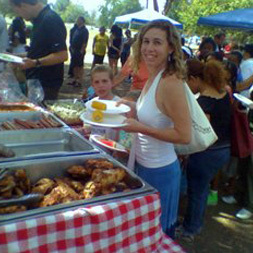 Outback Catering is a Los Angeles BBQ Catering Service and Long Beach California Barbecue Catering Service. 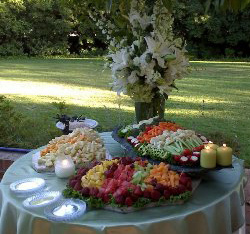 Outback Catering has many years of experience with Catering, so expect fresh presentation and the finest of quality. 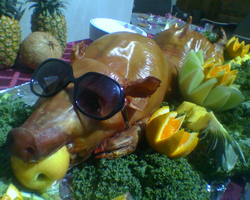 As a LA CA BBQ Catering Service, we also specialize in Greater Los Angeles Barbecue Catering, Theme Catering, Los Angeles Luau Catering, Pig Roasts and much more.